Be sure that boiled eggs are cool and dry. Place a double folded kitchen towel and place it on the table underneath child’s hands so if the egg slips out it will have a soft cushion to land on. 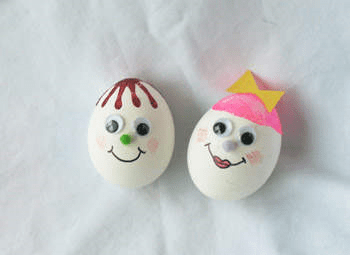 Place boiled eggs into an empty egg carton for stability. Place some paint onto a paper plate or a small dish or palette. Add several drops of water to the paint to thin it out. Using the paintbrush, place a generous dot of paint on top of your egg. 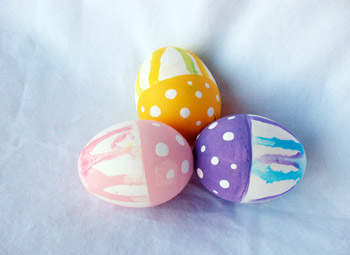 If the paint is not thin enough to start dripping down the egg, add another generous dot. If it still doesn’t drip, dip your paintbrush in water and add to the dot on the egg until it begins dripping down the egg. Repeat this several times so that it drips down around the egg several times. Use two different colors to create your drips. Allow the drips to dry completely. If your eggs begin to stick to the cardboard egg carton, carefully loosen them and scrape off any cardboard from the egg with your fingernail, then move them to a different area of the carton to continue drying. When completely dry, carefully hold the egg upside down and paint the bottom half of the egg solid, this will cover up the end of the drips. Place the egg upside down to allow the solid area to dry. If needed, repeat with another coat and let dry again. When dry, use the handle end of a paintbrush dipped in white paint to add polka dots to your solid color. Let dry. 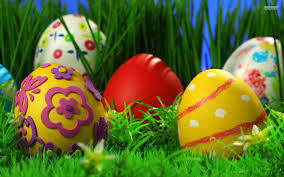 Directions: You will need to decorate only one side of the egg at a time. Let the eggs dry either on egg cartons turned upside down, on a cooling rack or film canister lid. Decorate other side when first side is dry.